Water runoff from precast plants is catching the attention of environmental regulators. In particular, the water from coring operations is being scrutinized because of its acidity and other components. This is causing precasters to come up with the solutions for handling the water and sludge from their coring operations. The basic water recycling and sludge containment design allows you to reuse the water during the coring operation. The design principle is to contain the used water in a two-compartment septic tank(s)/chamber(s) that allows the sludge to settle to the bottom and cleaner water to move into another compartment. Once the water has moved into the next compartment, it moves to an outlet fitted with a filter. The water then moves into a catch basin where a pump is located. From the catch basin, the water is pumped back through the coring operation. The more containment and settling tanks/chambers you use in your system, the cleaner the recycled water will be. The system should be sized so that it can contain two days of coring water. Coring a 12” hole uses about 3.5 gallon of water per minute and takes approximately 3 minutes to core. A standard two-compartment 1,200-gallon septic tank then would hold the water from 120 twelve inch cored holes. This is 6 hours of continuous coring a day. If you are not going to use the used coring water to clean, the water volume into the tank will be increased. You will need to take this extra water into account in your design. A 12” cored hole through a 48” ID manhole can produce on average .0133 cubic feet of sludge or 23.05 cubic inches per a 12” cored hole. As a comparison, a standard sized 34” cored hole through a 60” ID manhole with a 6” wall can produce on average .046 cubic feet of sludge or 80.56 cubic inches per a 34” cored hole. If you clean the tank/chamber when it is 1/3rd full of sludge this means that a tank/chamber sized at 5”W x 8’L x 5’D, will hold sludge from 5,012 twelve inch cored holes or 1,449 thirty-four inch cored holes. There are a variety of water capture designs used in today’s manhole coring operations. The most primitive operations let it run under the machine and hose the sludge from around and under the machine. This is a safety hazard. The sludge is very slick. 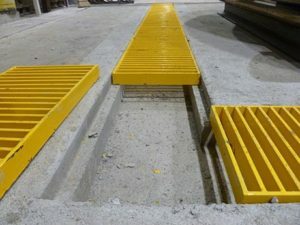 The design we like best is a trench around the machine with grates fitted so they are flush to the floor. The trench is sloped to a catch basin where the first or second sludge settlement takes place. This catch basin captures the sludge and then the water moves into a final settling tank. The left over water can then flow into a settling pond or a disposal method of the producer’s choice. One final note about this design is that the trench actually has weirs built into the slope and this is where the first sludge capture takes place. The trench is designed so that a flat bottom shovel can be used to remove the sludge from the trench. 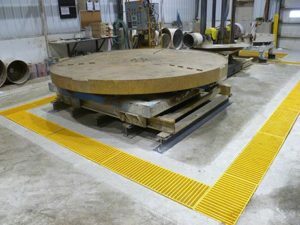 This is a great design by Hancock Concrete in Hancock MN. You can also capture water and sludge with a “sloped basin” or sloped floor under the coring machine/turntable that has a trench and grate at its lowest point. After capturing the water and sludge at the coring area, the water moves by gravity into the containment/settling tank. In the case of the “sloped basin” capture system, the highest points of the basin can be fitted with perforated pipes and the used water pumped through the perforated pipes to keep the sludge from gathering in the basin and keep a steady stream of water flowing through the system. For flat coring floors, perforated pipes can be placed in the trenches to keep the sludge from accumulating and water flowing through the system, too. The manner in which you must dispose of the sludge dictates the details of the above design. The sludge can be pumped from the tank/chamber by a septic pumper/vac truck or it can be scooped or vacuumed from the tank/chamber. In some areas, the septic disposal pumpers can dispose of the sludge at the sewage treatment plant or at a private disposal facility. If this is the case, then a standard two-compartment septic tank fitted with a filter can be used in your design. If you are unable to dispose of the sludge by pumping, then a design that allows easy access into the top of the chamber so it can be scooped or vacuumed out may be your best option. In this case, you may dispose of the sludge, after it dries, in the same manner you currently dispose of other concrete. Each coring operation is different so it is impossible to design one that fits all coring operations. A design may have to be based on your current footprint. You must research what is the best way to dispose of the sludge before you design your coring operation. The above suggestions are a starting point to help you design a system that works for you.